Aim: The aim of this study was to investigate the outcome of pregnancy among women with threatened miscarriage, and the risk factors that can affect it and to determine the effect of bed rest and progestogen therapy on that outcome. Materials and Methods: This is a retrospective study that involved all pregnant women who attended the Early Pregnancy Assessment Unit in Latifa Hospital in Dubai with an intrauterine pregnancy and vaginal bleeding up to 14 weeks of gestation. The study was done in the period from March 2010 to March 2011. The main outcome measures included gestational age, baby weight at delivery and placental outcome. Results: A total of 129 pregnant women who met the inclusion criteria were analysed. The early foetal loss rate was 37.2%. Of the remaining, 62.8% who had continued their pregnancy, 23.4% of them had pre-term delivery and 9.9% had placental abruption. Regarding the baby outcome, 35.8% of women delivered low-birth-weight (LBW) babies (<2.5 kg). There was a statistically significant effect of increasing maternal age, increasing gravidity and increasing number of previous miscarriages on increasing the risk of miscarriage in current pregnancy (P < 0.05). 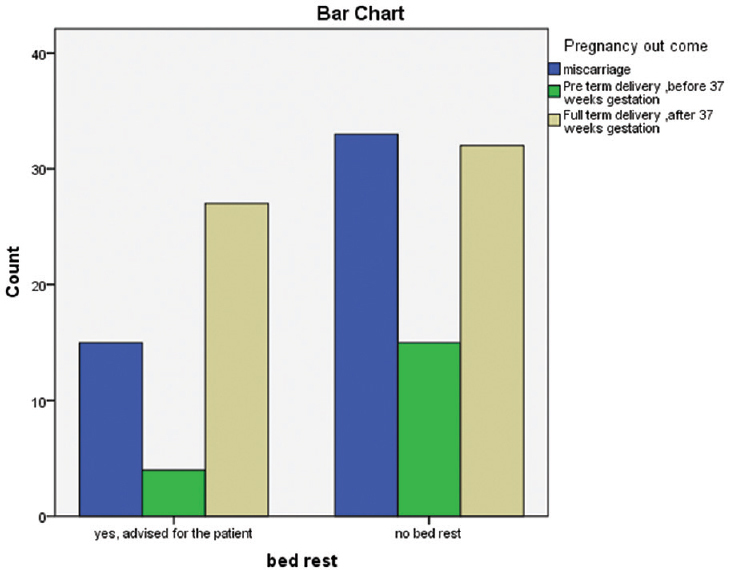 No significant difference was found in using bed rest for the management of threatened miscarriage. On the other hand, using progestogen therapy significantly reduced the rate of miscarriage and the rate of LBW babies (P < 0.05). However, we found it had no significant effect on reducing pre-term delivery. Conclusions: Vaginal bleeding in early pregnancy (i.e. threatened miscarriage) is an important risk factor for adverse pregnancy outcomes, which should be taken into consideration when deciding on antenatal surveillance and counselling after a bleeding event. Overall, the results showed the positive effect of using progestogen therapy on pregnancy outcome. However, strong meta-analyses of prospective studies with good methodological quality are still needed to support its routine use in threatened miscarriage management. Vaginal bleeding related to miscarriage, i.e., threatened miscarriage is the most common cause of the first trimester bleeding, and is the most common reason for general practitioner emergency gynaecology referrals. The term ‘threatened’ is used to describe these cases because miscarriage does not always follow uterine bleeding in early pregnancy, even after repeated episodes of large amounts of bleeding. In fact, more than half of the women with threatened miscarriage will not miscarry their pregnancies. A diagnosis of threatened miscarriage is associated with considerable physical and psychological morbidity to the woman. Many interventions have been used for preventing miscarriage in patients with threatened miscarriage and early vaginal bleeding depending on the disorder thought to be the etiological factor. In conclusion, similar to other parts of the world, here in the UAE region, vaginal bleeding in early pregnancy is a common condition that adds stress and anxiety to both pregnant women and their doctors. Therefore, obstetricians are regularly dealing with such cases whether it is in an outpatient clinic or in an accident and emergency setting. Data from studies, such as this done locally, will aid clinicians in giving them valuable data, which in turn will guide their practice, counselling and management. Had follow-up or delivery at our institution. -Pregnancy with an intrauterine contraceptive device. Gestational age was determined from the onset of last normal menstrual period and confirmed by the measurement of the crown-rump length in an early ultrasound scan. Data were obtained from two sources as follows: from antenatal files in the Medical Record Section of Latifa Hospital and the maternity registry which is present in the delivery suite of the hospital. Data obtained from the maternity registry included the total number of deliveries, total number of live births, stillbirths, pre-term births, LBW babies and placental abruptions. All other data pertaining to the individual study subjects were obtained from their respective antenatal files. The following variables which are confounding factors that may possibly but not definitely increase the risk of miscarriage in women with early vaginal bleeding were recorded for each case as follows: demographic data (age and parity), number of previous miscarriages, socioeconomic status (education, job, income level and smoking) and current medical illnesses (diabetes mellitus, hypertension, thyroid disease, autoimmune disease, for example, systemic lupus erythematosus and rheumatoid arthritis). Type of management prescribed for each case was documented whether it is bed rest or progestogen supplements or no treatment. Full-term delivery defined as delivery after completed 37 weeks of gestation. The cut-off gestational age for the above classification in based on Latifa Hospital's internal protocol which considers a gestational age of 23+0 weeks as a limit for viability (which is around the average for WHO-20 weeks and UK-24 weeks' viability limits). In addition, the hospital's internal coding system, which labels women with gestational ages below 23 weeks as gynaecology cases and those 23 weeks and above as antenatal cases, was used as an additional tool in selecting the study subjects and ensuring only patients which met the study criteria were included in the study. An excel sheet (Microsoft Excel 2013) was used for data collection and presentation. Statistical analysis was performed using IBM SPSS 20.0.1 for Windows98 (SPSS 20.0, 1, IBM, Armonk, NY, United States of America). Pearson correlation test, ANOVAs test and paired independent sample t-test were used in data analysis. P < 0.05 was taken as being statistically significant. The study was approved by the Medical Research Committee of Dubai Health Authority. The study group consisted of 129 pregnant women with early vaginal bleeding who met the inclusion criteria of this study. The women had a median age of 28 years (age range was 18–37). 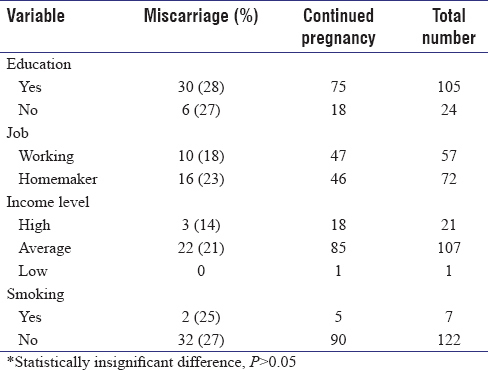 A total of 73.8% were multiparous and 39% had no previous miscarriage as shown in [Table 1]. Overall, 48 women went to miscarry giving a pregnancy loss rate of 37.2%. 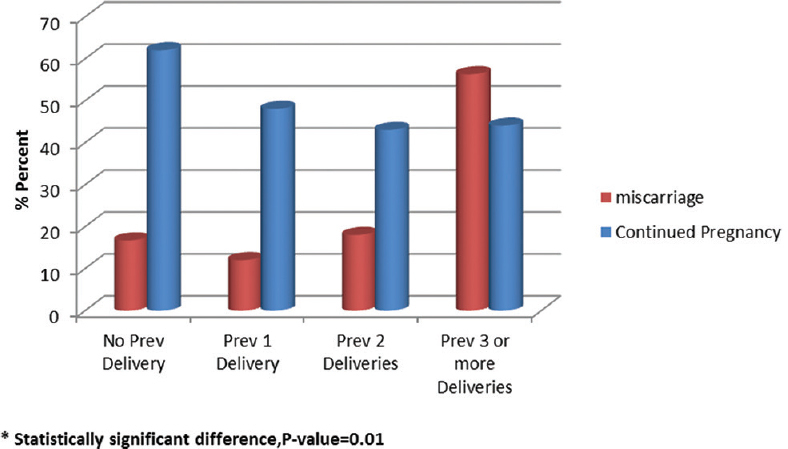 Of the remaining 81 women, 19 of them had pre-term delivery and the other 62 had full-term delivery, giving a rate of 14.7% and 48.1% for pre-term delivery and full-term delivery, respectively, as shown in [Figure 1]. 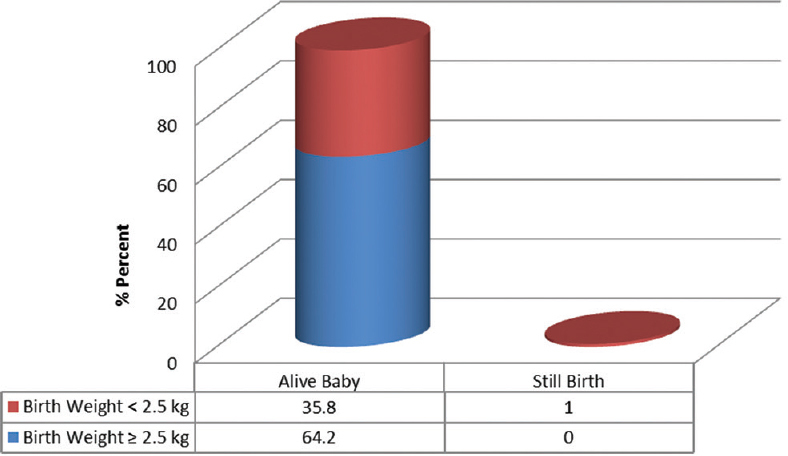 The baby outcome for the women who continued their pregnancy is shown in [Figure 2]. A total of 98.7% of women delivered an alive baby with 35.8% of them having LBW babies. The placental outcome for women who continued their pregnancy is shown in [Figure 3]. The majority (88.8%) of them had a normal placenta. 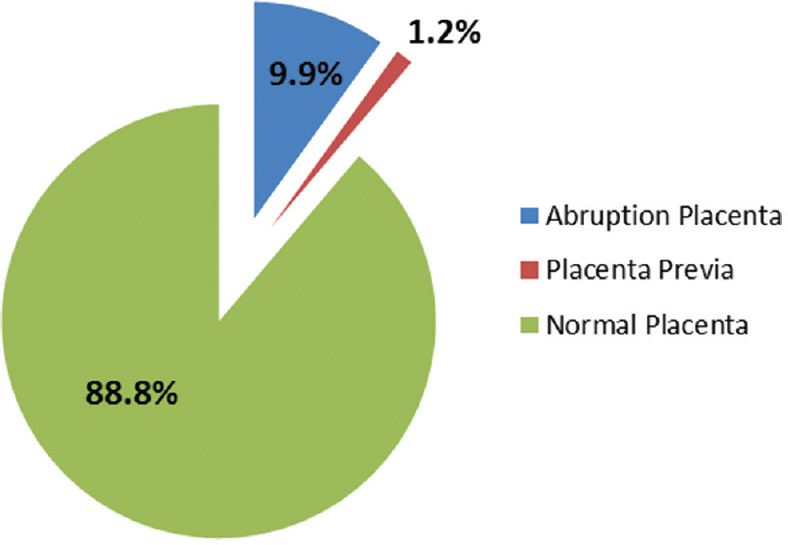 However, 9.9% of them had placental abruption. With relevance to the possible confounding factors, increasing maternal age, multiparity and number of previous miscarriages showed a statistically significant increase in risk of miscarriage in women with early vaginal bleeding (P < 0.05). This can be translated into an association between being a multipara with early vaginal bleeding and an increase in ones risk of miscarriage. Furthermore, the older the woman is the more her risk for miscarriage in the event of early vaginal bleeding. In addition, the more the number of previous miscarriages a woman had and the more the risk of miscarriage are in the current pregnancy in the presence of early vaginal bleeding. These are shown in [Figure 4] and [Figure 5] and in [Table 2], respectively. Positive history of a medical illness showed a statically significant increase in miscarriage in women with either thyroid disease or epilepsy in the event of early vaginal bleeding as shown in [Table 3]. Other variables such as the presence of smoking regardless of how long or how much the cigarette use was since this data were not available in the files of the patients did not show a statistically significant increase of miscarriage risk for women with early vaginal bleeding [Table 4]. However, we have to acknowledge that smoking is not common in general in the UAE population due to the cultural background and is considered a stigma among UAE women. There was no statistically significant relationship between bed rest and decreasing the risk of miscarriage in women with early vaginal bleeding (P = 0.131) as shown in [Figure 6]. On the other hand, a statistically significant relationship was found between using progestogens and decreasing the risk of miscarriage (P = 0.001, Pearson correlation = −0.391) as shown in [Figure 7]. In addition, using progestogen significantly decreased the risk of having LBW babies, (P = 0.013) as shown in [Figure 8]. However, its use did not show a significant decrease in pre-term deliveries. Women with threatened miscarriage have a higher likelihood of miscarrying than those without early vaginal bleeding. Some of the studies such as Davari-Tanha et al. and Everett et al. reported miscarriage rate as high as 43.7% whereas others reported miscarriage incidence of 9.3% in the first trimester. This variation is mostly related to the fact that the definition of threatened miscarriage is rarely stated in explicit terms. Some studies have defined the first trimester up to 12 weeks, and others up to 14 weeks., Moreover, it is possible that the risk of adverse outcome may be different in women who experience ‘light’ versus ‘heavy’ bleeding. In this retrospective study, the miscarriage rate was 37.2%, which is comparable with other published studies.,,,,, Hence, this study showed that 62.8% of women continued their pregnancy, i.e., more than half of the women with early vaginal bleeding did not have a miscarriage. In this study, 14.7% of women with early vaginal bleeding had pre-term deliveries which account for around 10% of the total pre-term deliveries in Latifa Hospital in the same period of the study (2010). However, slightly more, i.e. 35.8% of women with early vaginal bleeding who continued their pregnancy had LBW babies. This accounted for 8.4% of all LBW babies registered in the same study period in Latifa Hospital. In addition, 9.9% of pregnant women with early vaginal bleeding who continued their pregnancy had placental abruption, which accounts for 60.2% of all placental abruptions in that year. All of this significant percentages support the association between early vaginal bleeding and adverse pregnancy outcomes. Other variables, which may pose as possible confounding factors for miscarriage such as maternal age, parity, number of previous miscarriages, presence of medical illnesses, socioeconomic status and smoking status, were assessed in our study. However, multivariate analysis through meta-analysis is needed to clarify the causality of some observed associations; therefore, some associations in our study should be interpreted with caution. Yang et al. found that older women were at increased risk for vaginal bleeding during pregnancy. Advancing maternal age is an important risk factor for miscarriage in general, primarily due to a decline in oocyte quality. Changes in uterine and hormonal function may also play a role. Our study has showed that miscarriage rate was higher in the age group from 33 to 37 years old in comparison to the younger age groups. Past obstetric history is also an important predictor of subsequent pregnancy outcome. With regards to past obstetric history, a history of previous miscarriages was evaluated in this study. The result showed a significant effect on risk of miscarriage; those women with early vaginal bleeding who had a history of previous miscarriages had more risk to miscarry in comparison to women who did not have any previous miscarriages. Some studies have shown an increased risk of miscarriage with increasing gravidity,, while others have not. Our study showed that being a multipara will increase the risk of having a miscarriage in current pregnancy more than being a primigravida. Possible reasons for this association include (1) reproductive compensation behaviour (i.e., a behaviour pattern in which couples make repetitive attempts to bear children after miscarriage) and (2) short interpregnancy intervals in multigravida women. Although previous studies have showed that heavy smoking (>10cig/day) is associated with increased risk of miscarriage,, our study showed that smoking did not increase miscarriage rate among our study population. However, this may not be completely accurate since (1) number of cig/day was not defined in this study since this information was not available in the patient files, rather the presence or absence of smoking only was measured; (2) the fact that our study sample is from a conservative population who mostly do not smoke decreases the overall smoking rate, hence, it is difficult to assess any association with miscarriage and (3) even if it is present, it is more likely to be underreported since smoking is considered a social stigma for women in this region. Maternal medical illnesses, especially endocrinopathies, which are confounding factors for adverse pregnancy outcome in general, can contribute to suboptimal host environment that can lead to miscarriage. Direct evidence of causality, however, is still lacking with conflicting and controversial data have also been reported. Some studies showed increased risk of miscarriage in poorly controlled DM. Others reported an increased rate of foetal loss in women with high serum thyroid antibody concentration. Our study showed that a pregnant woman with a medical history of epilepsy or thyroid disease and had early vaginal bleeding will have more risk of miscarriage than those with no medical illnesses. Bed rest is commonly recommended; however, randomised trials have not found that bed rest at home or in the hospital is beneficial in preventing foetal loss in women with threatened miscarriage.,, Our study also showed that whether bed rest was advised or not, no significant difference was found on the pregnancy outcome in women with threatened miscarriage. 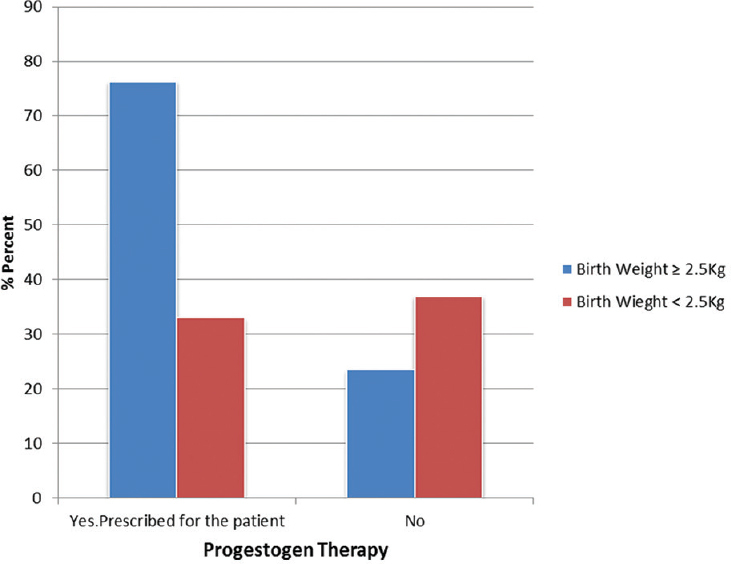 Treatment with progestogens is the most promising treatment for threatened miscarriage and is supported by good number of meta-analysis studies, which also showed its significant effect on improving pregnancy outcome and baby birth weight., However, those analyses were limited by the small number of participants and poor methodological quality. Progesterone modulates the immune response of the mother to prevent rejection of the embryo, and it enhances uterine quiescence and suppresses uterine contractions. Many miscarriages are caused by genetic abnormalities in the conceptus, and in this case, it is unlikely that progestogen supplementation could prevent it. That's why the evidence is still insufficient to make a recommendation for or against the routine use of progestogen supplementation for the treatment of women with threatened miscarriage. Development of interventions, such as progestogen supplementation, clearly requires further investigation. However, the identification of women at risk would allow such interventions to be implemented earlier in gestational age. This is a retrospective, descriptive hospital-based study in a tertiary healthcare centre, and therefore, selection bias is unavoidable. In addition, recall bias is possible since data were collected from the medical files of patients, and the medical history is given by the patient's themselves. It was not possible at times to collect all the information that was needed from the antenatal files like the details of smoking as explained earlier, i.e. number of years of smoking, cigarettes/day, etc., as this information was missing. It was also not possible to study a population completely devoid of any medical illnesses since this is a retrospective study including all subjects with the condition under study, i.e. threatened miscarriage in a specific time period. These were, therefore, defined as confounding factors for miscarriage and adverse pregnancy outcome and were studied separately as secondary objectives. This study was done in a single tertiary care centre (Latifa Hospital) in Dubai, UAE; hence, other major governmental and private sections in Dubai were not included, raising the need for a large multi-centre study with a large database that will provide more precise information on this important topic. Vaginal bleeding in early pregnancy is a common clinical entity, and the association between it and adverse pregnancy outcome is well known. This generates much anxiety for women with this condition, even when a live foetus is identified at ultrasound scan. Our data have demonstrated that bleeding in early pregnancy (threatened miscarriage) is followed by a live birth in more than half of the affected pregnancies. This study also showed its association with adverse pregnancy outcome such as pre-term delivery and LBW babies. These data can be used by clinicians to advise women about the risk of miscarriage and to plan their follow-up. This would also result in a higher index of suspicion in women with a history of early vaginal bleeding/threatened miscarriage, who present with symptoms later in pregnancy, enabling prompt identification of these complications that eventually will improve the maternal and neonatal outcomes. The effect of using progestogen supplementation in decreasing rate of miscarriage and decreasing rate of LBW babies in management of threatened miscarriage has been supported by this study; and as is the case in any treatment which might prove to be effective it is worth further investigation. We strongly recommend a thorough investigation of the use of progestogen supplementation in this important and common health problem through a multi-centre, methodologically-sound, randomised study in the UAE. Errol R, Shin J. Etiology and Evaluation of Vaginal Bleeding in Pregnant Women. UptoDate Official Website; c2012. Available from: http://www.uptodate.com/contents/vaginalbleeding/. [Last accessed on 2011 Jun 02; Last updated on 2012 Mar 27]. Togas T, Haya M. Spontaneous Abortion: Risk Factors, Etiology, Clinical Manifestations, and Management. UptoDate Official Website; c2012. Available from: http://www.uptodate.com/contents/spontaneousabortion/. [Last accessed on 2016 May 02; Last updated on 2016 May 02]. Amy V, Carrie F, Antonia N, Thomas S. Early Pregnancy Loss, Berek and Novak's Gynecology. 15th ed. Baltimore: Williams & Wilkins. ; 2012. Mulik V, Bethel J, Bhal K. A retrospective populationbased study of primigravid women on the potential effect of threatened miscarriage on obstetric outcome. J Obstet Gynaecol 2004;24:24953. DavariTanha F, Shariat M, Kaveh M, Ebrahimi M, Jalavand S. Threatened miscarriage, a risk factor for poor pregnancy outcome. Acta Med Iran 2008;46:314. Saraswat L, Bhattacharya S, Maheshwari A, Bhattacharya S. Maternal and perinatal outcome in women with threatened miscarriage in the first trimester: A systematic review. BJOG 2010;117:24557. Johns J, Jauniaux E. Threatened miscarriage as a predictor of obstetric outcome. Obstet Gynecol 2006;107:84550. Weiss JL, Malone FD, Vidaver J, Ball RH, Nyberg DA, Comstock CH, et al. Threatened abortion: A risk factor for poor pregnancy outcome, a populationbased screening study. Am J Obstet Gynecol 2004;190:74550. Poulose T, Richardson R, Ewings P, Fox R. Probability of early pregnancy loss in women with vaginal bleeding and a singleton live fetus at ultrasound scan. J Obstet Gynaecol 2006;26:7824. Tongsong T, Srisomboon J, Wanapirak C, Sirichotiyakul S, Pongsatha S, Polsrisuthikul T, et al. Pregnancy outcome of threatened abortion with demonstrable fetal cardiac activity: A cohort study. J Obstet Gynaecol (Tokyo 1995) 1995;21:3315. Everett C. Incidence and outcome of bleeding before the 20th week of pregnancy: Prospective study from general practice. BMJ 1997;315:324. 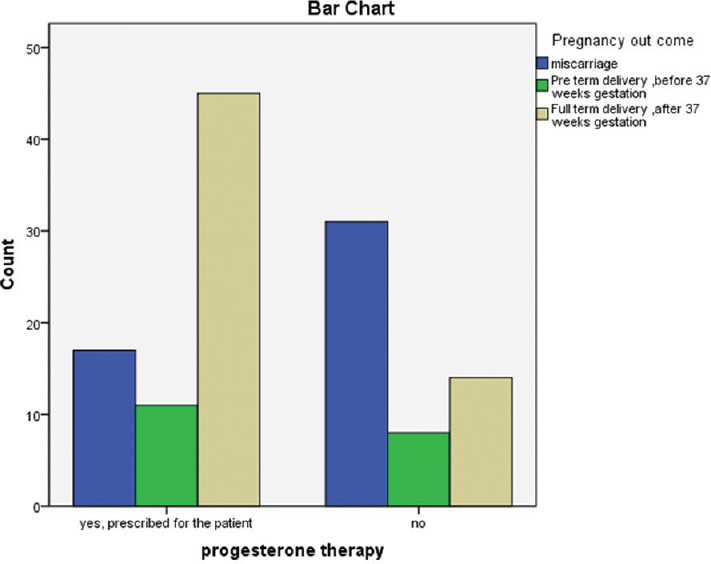 Wijesiriwardana A, Bhattacharya S, Shetty A, Smith N, Bhattacharya S. Obstetric outcome in women with threatened miscarriage in the first trimester. Obstet Gynecol 2006;107:55762. Sotiriadis A, Makrigiannakis A, Stefos T, Paraskevaidis E, Kalantaridou SN. Fibrinolytic defects and recurrent miscarriage: A systematic review and metaanalysis. Obstet Gynecol 2007;109:114655. Dosiou C, Giudice LC. Natural killer cells in pregnancy and recurrent pregnancy loss: Endocrine and immunologic perspectives. Endocr Rev 2005;26:4462. Yang J, Hartmann KE, Savitz DA, Herring AH, Dole N, Olshan AF, et al. Vaginal bleeding during pregnancy and preterm birth. Am J Epidemiol 2004;160:11825. Hossain R, Harris T, Lohsoonthorn V, Williams MA. Risk of preterm delivery in relation to vaginal bleeding in early pregnancy. Eur J Obstet Gynecol Reprod Biol 2007;135:15863. Lykke JA, Dideriksen KL, Lidegaard O, LanghoffRoos J. Firsttrimester vaginal bleeding and complications later in pregnancy. Obstet Gynecol 2010;115:93544. Gracia CR, Sammel MD, Chittams J, Hummel AC, Shaunik A, Barnhart KT, et al. Risk factors for spontaneous abortion in early symptomatic firsttrimester pregnancies. Obstet Gynecol 2005;106:9939. Nybo Andersen AM, Wohlfahrt J, Christens P, Olsen J, Melbye M. Maternal age and fetal loss: Population based register linkage study. BMJ 2000;320:1708-12. Aleman A, Althabe F, Belizán J, Bergel E. Bed rest during pregnancy for preventing miscarriage. Cochrane Database Syst Rev 2005;18:CD003576. Ness RB, Grisso JA, Hirschinger N, Markovic N, Shaw LM, Day NL, et al. Cocaine and tobacco use and the risk of spontaneous abortion. N Engl J Med 1999;340:3339. Chatenoud L, Parazzini F, di Cintio E, Zanconato G, Benzi G, Bortolus R, et al. Paternal and maternal smoking habits before conception and during the first trimester: Relation to spontaneous abortion. Ann Epidemiol 1998;8:520-6. Mills JL, Simpson JL, Driscoll SG, JovanovicPeterson L, Van Allen M, Aarons JH, et al. Incidence of spontaneous abortion among normal women and insulindependent diabetic women whose pregnancies were identified within 21 days of conception. N Engl J Med 1988;319:161723. Anselmo J, Cao D, Karrison T, Weiss RE, Refetoff S. Fetal loss associated with excess thyroid hormone exposure. JAMA 2004;292:6915. Wahabi HA, Fayed AA, Esmaeil SA, Al Zeidan RA. Progestogen for treating threatened miscarriage. Cochrane Database Syst Rev 2011;12:CD005943. Devaseelan P, Fogarty PP, Regan L. Human chorionic gonadotrophin for threatened miscarriage. Cochrane Database Syst Rev 2010;5:CD007422. Lede R, Duley L. Uterine muscle relaxant drugs for threatened miscarriage. Cochrane Database Syst Rev 2005;3:CD002857. Rumbold A, Middleton P, Pan N, Crowther CA. Vitamin supplementation for preventing miscarriage. Cochrane Database Syst Rev 2011;1:CD004073. Allen C, Glasziou P, Del Mar C. Bed rest: A potentially harmful treatment needing more careful evaluation. Lancet 1999;354:122933. Kovacevich GJ, Gaich SA, Lavin JP, Hopkins MP, Crane SS, Stewart J, et al. The prevalence of thromboembolic events among women with extended bed rest prescribed as part of the treatment for premature labor or preterm premature rupture of membranes. Am J Obstet Gynecol 2000;182:108992. 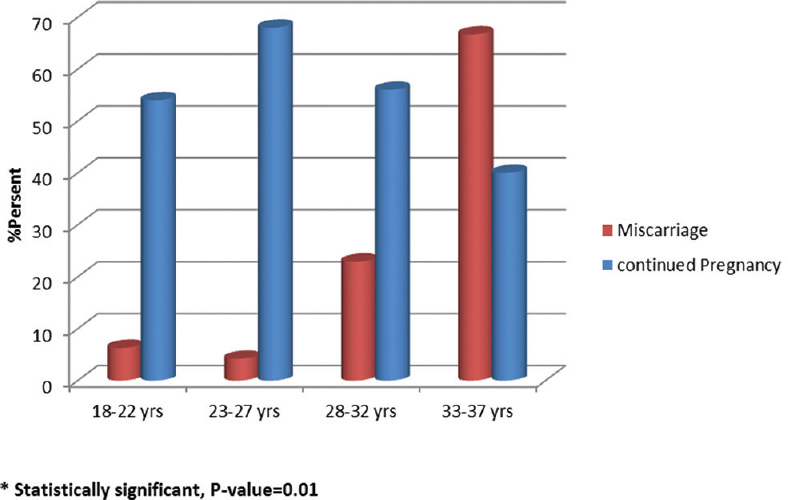 Lapple M, Occupational factors in spontaneous miscarriage. Zentralblatt for Gynecology 1990; 112:457. Carp H. A systematic review of dydrogesterone for the treatment of threatened miscarriage. Gynecol Endocrinol 2012;28:983-90. SzekeresBartho J, Barakonyi A, Par G, Polgar B, Palkovics T, Szereday L, et al. Progesterone as an immunomodulatory molecule. Int Immunopharmacol 2001;1:103748. Levy B, Sigurjonsson S, Pettersen B, Maisenbacher MK, Hall MP, Demko Z, et al. Genomic imbalance in products of conception: Single-nucleotide polymorphism chromosomal microarray analysis. Obstet Gynecol 2014;124:202-9. Errol N, Charles L. Progesterone supplementation to reduce the risk of spontaneous preterm birth. Up To Date official Website; Updated March, 2017. Available from: http://www.uptodate.com/contents/Prog esterone-supplementation-to-reduce-the-risk-of-spontaneous-preterm-birth. [Last accessed on 2017 Apr 19]. Dodd JM, Jones L, Flenady V, Cincotta R, Crowther CA. Prenatal administration of progesterone for preventing preterm birth in women considered to be at risk of preterm birth. Cochrane Database Syst Rev 2013;7:CD004947. Kuon RJ, Shi SQ, Maul H, Sohn C, Balducci J, Maner WL, et al. Pharmacologic actions of progestins to inhibit cervical ripening and prevent delivery depend on their properties, the route of administration, and the vehicle. Am J Obstet Gynecol 2010;202:455.e1-9. O'Sullivan MD, Hehir MP, O'Brien YM, Morrison JJ. 17 alpha-hydroxyprogesterone caproate vehicle, castor oil, enhances the contractile effect of oxytocin in human myometrium in pregnancy. Am J Obstet Gynecol 2010;202:453.e1-4. Simmons LE, Rubens CE, Darmstadt GL, Gravett MG. Preventing preterm birth and neonatal mortality: Exploring the epidemiology, causes, and interventions. Semin Perinatol 2010;34:408-15. Newnham JP, Dickinson JE, Hart RJ, Pennell CE, Arrese CA, Keelan JA, et al. Strategies to prevent preterm birth. Front Immunol 2014;5:584. Manuck TA, Esplin MS, Biggio J, Bukowski R, Parry S, Zhang H, et al. Predictors of response to 17-alpha hydroxyprogesterone caproate for prevention of recurrent spontaneous preterm birth. Am J Obstet Gynecol 2016;214:376.e1-8. Manuck TA, Stoddard GJ, Fry RC, Esplin MS, Varner MW. Nonresponse to 17-alpha hydroxyprogesterone caproate for recurrent spontaneous preterm birth prevention: Clinical prediction and generation of a risk scoring system. Am J Obstet Gynecol 2016;215:622.e1.